After many years, Soldier Kings remains a steady seller in our lineup, what’s called an “evergreen title” in game industry lingo. And while we’ve given it a pretty good level of Daily Content support, we’ve never supplied a Publisher’s Overview. 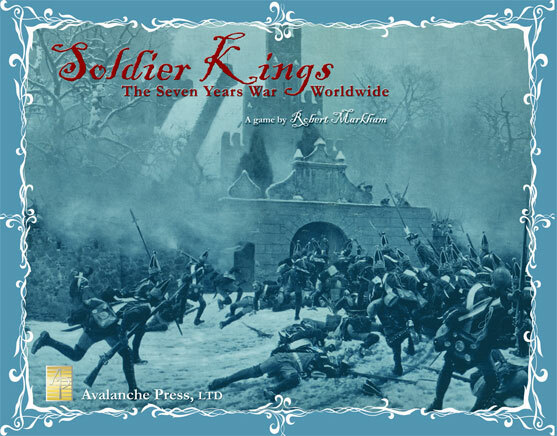 Soldier Kings, designed by Rob Markham, is a game for two to eight players based on the Seven Years War all around the globe. Provinces are represented by boxes, with the region’s rating for resources and manpower produced, fortification level, whether it’s a port, and who owns it at the start of the game. The main map represents Europe from Portugal to Moscow, and the world map includes sections for India, the Spice Islands, the Americas and West Africa. There’s also a fleet movement chart to let you transfer your ships and men between these areas. Units are fleets and armies, of varying quality, and you also have leaders, also of varying quality, to help them move and fight better. They’re chosen randomly: when you buy an army or a fleet, or get one in the initial setup, you don’t know just what you’re getting. You move them along the connections between provinces, and when you meet an enemy force in a province (or sea area) you fight them. It’s a little more subtle than that, and you can read up on exactly how to play in this handy five-minute guide to learning how to play Soldier Kings. The real strategy in Soldier Kings comes in its diplomatic interactions and its card play. There are no neutral powers in Soldier Kings: there are only enemies you haven’t attacked yet. There are alliances, which can shift (though not always easily), and a peace treaty can briefly bring about a time of peace. Each player has a hand of cards, which can be played by anyone at any time after the countdown at the start of the game (to keep players from flinging down their cards before everyone’s had a chance to pick theirs up in the initial deal). These introduce a myriad of random events: death of a rule, starvation or disease among the troops, a minor country alliance, a new leader, rich or poor harvests, revolting provinces, mercenaries, piracy, cannibalism (yes, cannibalism) and more. Physically, the game’s pretty simple but attractive. It has two paper maps: one of Europe, one of everywhere else. There are 165 large pieces representing fleets and armies, with generic ships and mobs of little soldiers on them. There are another 140 smaller pieces, with leaders and various markers needed for play (control of territories, siege progress and such). Victory comes through the capture of provinces, with wealthier provinces being worth more. Provinces can be tough to conquer: they have a “fortification value” that pretty much acts as an intrinsic garrison, and you’ll have to reduce this by siege. While you’re sieging away, an enemy army can come try to force you to break it off and fight them instead (and if the province is valuable enough, you can be pretty sure of this happening). We provided some modifications to that with Enlightened Warlords: A Player’s Guide to Soldier Kings. 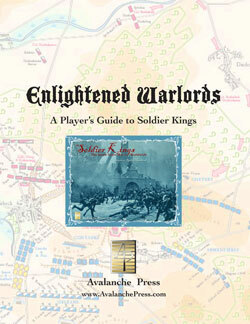 Enlightened Warlords is a book supplement for Soldier Kings, with history, strategy and variants. Lots of great variants: not all provinces are equal to all powers. Austria covets Silesia just as Prussia seeks Saxony and Spain wants Gibraltar; Turkey doesn’t much care what happens to any of those but does want Transylvania back. The players also get a bunch of non-territorial objectives: some want to maintain the balance of power, some want to see particular rivals humiliated, some have goals related to trade or religion. Usually these goals conflict with those of other players, including allied powers. There are some other nice additions: each Great Power has a super power of some sort: the Prussians can counterfeit other peoples’ money, the British have an edge in shipbuilding, the Dutch have advantages in finance and so forth. And some pre-war options to shake up your game: what if Frederick the Great had married Maria Theresa instead of going to war with her, or been executed by his nutball father as almost happened? The upcoming Soldier Kings: The Potato War goes even further, with a map extension adding the lands around the Black Sea (you can see the new map right here) and additional pieces, plus scenarios for the 1768 Russo-Ottoman War and the 1778 War of the Bavarian Succession (the Potato War). Plus we’ve given Soldier Kings a lot of Daily Content extras, like these awesome Fancy Player Cards. Soldier Kings has been one of our most popular games for well over a decade. It’s one of the very few we’ll keep in print as long as there is an Avalanche Press. Click here to order Soldier Kings right now. Yes, now. Click here to order Enlightened Warlords right now. You need this too.